As a WordPress Technology Software theme, Softing gives you an unlimited number of landing pages, with its clean and powerful features and provides you a unique grid system such as Bootstrap, with a responsive preview that works flawlessly on all devices. With the help of WPBakery Page Builder, which is already integrated into the theme, you can build dozens of different pages within hours. 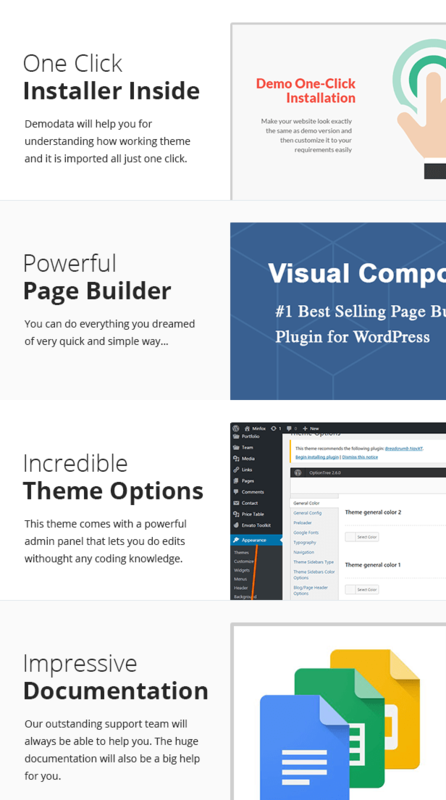 You can create your desired page structure with 40+ shortcodes that comes with WPBakery Page Builder and the special shortcodes that we created for the sections of the theme. Thanks to the 200+ extra features that we added in the Page Builder, you can easily find solutions to your parallax and mobile device problems without writing any codes. Softing, which includes the WordPress blog system, offers you an opportunity to marketing your products online through the use of Woocommerce. By using Softing, which meets all your needs in WordPress and has all technical features of 2019, you will save time and complete your project much faster. With the help of Oneclick Demodata Installer, you will have all the demo pages in a few minutes, even if you don’t have any technical knowledge. The whole installation will take less than 5 minutes. Besides, the documentation that covers the theme installation will be available with the theme. Softing, which runs flawlesly with the WordPress’s most important plugins such as Contact Form 7, WPML, Gravity Forms, Slider Revolution so you can get rid of concerns about such issues. Softing has been carefully builded in very important issues like WordPress SEO, will make you a step ahead in Search Engine ranking.